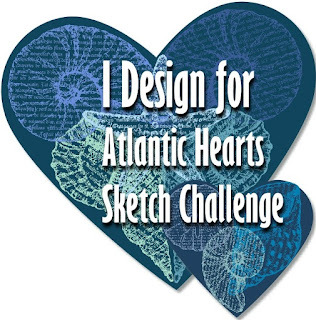 I'm trying out a new sketch challenge crew called Atlantic Hearts Sketch Challenge. 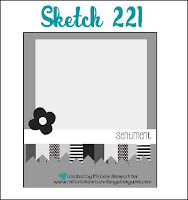 This week's idea to work from is this nifty looking scrap busting sketch. Here's what I came up with! A sweet lil thank you card for nearly any occasion. I colored in the confetti bumps with the gold shimmer brush for a bit of oomph. To make this card, I used my trusty toolkit. Some of these products are retiring on July 31st and some aren't available til August 1st*. Versamat™, SureCut™ Deluxe Craft Paper Trimmer, White Daisy Pomegranate Blossom Fern Lagoon Black Slate and Kraft Exclusive Cardstocks, Bashful* Blossom Pomegranate Sweet Leaf Fern and Black Exclusive Inks, Confetti Embossing Folder, Gold Shimmer Brush, Bashful Pearls*, Clear Sparkles, Non-stick Micro-tip Scissors, Adhesive Runner*, Happy Heart and Angel Policy My Acrylix® stampsets, Beautiful You Stamp + Thin Cuts, Stamping Starter Kit*, Bone Folder, White Cards & Envelopes Value Pack. 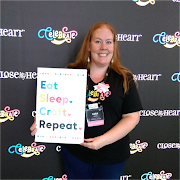 What can I help you create today? Welcome to the AHSC, Kara, I'm so glad you found your way here! What a great card! 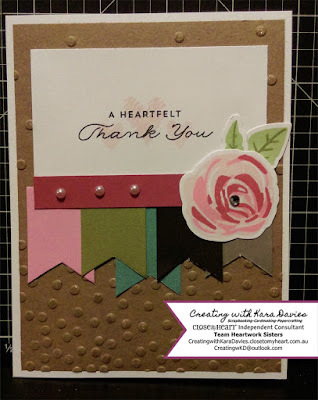 The Happy Heart sentiment works perfectly here, and I like how the colors pop against the embossed Kraft card base. The Beautiful You rose and the Bashful Pearls are just st the right touch to round everything out. Thanks for sharing with us this week at AHSC and I hope you keep coming back! Pretty card! Thanks for playing along with the AHSC challenge this week--please join us again soon! Such a pretty card! Love this! That flower is beautiful... Thanks so much for playing along with Atlantic Hearts! 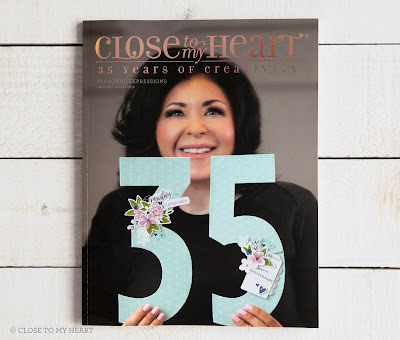 the flower is beautiful and love that you used kraft embossed paper in the background. Thanks for sharing with us at AHSC this past week.